The Honey brothers needed a bigger, better tractor to work larger swaths of land at their farm in Bracken in the southwest corner of Saskatchewan. The problem was they didn’t have the money to buy one. As it turns out, that wasn’t a problem at all. Glenn and Greg Honey instead built their own 425-horsepower tractor back in the late 1970s. Soon they were building rod weeders and combine headers, too. “What happens is then the neighbour wants one, then other people in the area want one, and then all of a sudden farmers across the province want one, and the brothers didn’t have the manufacturing infrastructure to support that demand,” says Jamie Pegg, general manager with Honey Bee Manufacturing. Within a few years, the Honey brothers had moved operations from a Quonset on their farm to a repurposed factory in Frontier, Sask. Today Honey Bee Manufacturing is one of dozens of success stories from innovative Saskatchewan farmers who saw a need and fulfilled it themselves by developing and ultimately manufacturing agricultural equipment. “It’s that old saying that necessity is the mother of invention, and that holds very much true here in Saskatchewan,” says Leah Olson, president of the Agricultural Manufacturers of Canada, based in Regina. To that end, Saskatchewan is a key piece of Canada’s agricultural manufacturing industry, which exports $1.8 billion worth of goods annually. “Of that total, coming out of Saskatchewan is $240 million,” she says of the diverse manufacturers scattered across the province, many of them specialized niche operations known as short-line manufacturers. Aside from Honey Bee, the list of companies to find success in Saskatchewan includes Bourgault, Schulte, Morris, Doepker, Seed Hawk and more. For its part, Honey Bee manufactures combine headers, swathers and rod weeders for not just Saskatchewan farmers, but those across Canada and in more than two dozen other nations, including the United States. But other manufacturers might specialize in augers, grain storage, rock pickers and an assortment of other equipment conceived of, designed and manufactured by Saskatchewan farmers. That’s not to say the little guys here in the province are not in fierce competition with the big players globally. But the secret to their success boils down to that old idea of building a better mousetrap — or in the case of Honey Bee — a better header. A lot is at stake, too. Dozens of communities depend on the success of these short-line manufacturers, he adds. “The population of the town of Frontier is about 300,” he says, adding that Honey Bee also employs people from neighbouring communities, often with less than 100 residents. These are more than just manufacturing jobs, too. Despite its size, importance and reputation among the global agriculture industry, this segment of the province’s economy has quietly flourished for the most part. “People in this province are mostly unaware of the fact that a lot of our small towns are these centres for innovative manufacturing,” Pegg says. 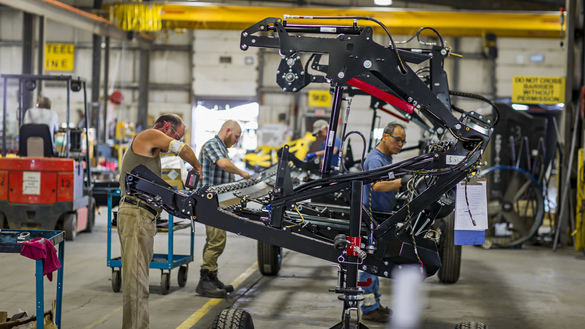 While agricultural manufacturing might fly under the radar, particularly in major urban centres, the provincial government is certainly aware of its importance. In fact, STEP — a non-profit partnership between government and the private sector — is an industry-leading initiative that other provinces are emulating, he adds. While others may be following in their footsteps elsewhere, the provincial government and ag manufacturing companies in Saskatchewan remain firmly focused on innovation and, in turn, growing revenues at home and abroad, Olson says.